Tonight we’re eating my version of shrimp and grits made with black tiger shrimp seared then tossed with a garlic, oregano, and lemon sauce. The shrimp were served over coursely ground yellow corn grits and garnished with oregano. T: were you inspired to make shrimp from the woman on the pier who said “camarones”? A: well, you know, i didn’t think about that but i did want shrimp after she said something about camarones. and i did make this the next day….perhaps you are right, my dear, perhaps you are right! T: it was quite a tasty meal. It seemed like something you would get in Louisiana, but I’m not sure i’ve ever actually had grits and shrimp in LA. T: shrimp and grits. grits and shrimp. You got shrimp you got grits. You got grits and shrimp or whatever. Yeah, maybe not quite traditional louisiana seasoning. I guess traditional louisiana would taste a little closer to, say, crawfish etouffee… or, rather, shrimp etouffee. T: I’ve never been to any of those strange lands that you speak of… ok, I have. I’ve never had shrimp and grits anywhere though. I didn’t know it was such a big thing. A: i don’t know that it’s a big thing, but where there are grits and shrimp, there are shrimp and grits! you know? T: true, true. These were some nice big shrimp, too. I know they didn’t come from San Diego waters. Any clue where they came from? T: large black tiger shrimp. wow I wouldn’t want to stumble across one of those while swimming in a river in China. A: heheheheh 😛 I know, he might bite your toe off or something. T: or worse. mmm. it was tasty though. I give it a 4.29/5. It didn’t score as well as it could have… perhaps because of the texture. It was a bit soupy. You saying that it was slop got my mind going in the wrong direction. The flavor was good. I enjoyed the brightness that the citrus offered. Your thoughts? A: I agree that tonight it was a bit soupy. (i actually made it yesterday for dinner and tonight we ate the leftovers) it probably got soupy from me adding a touch too much water tonight when i went to reheat the grits. other than that, i think it was pretty good. I give it a 4/5. It wasn’t something i would want to eat everyday. frankly, i would much prefer my shrimp not to be in a gravy like substance. I did enjoy the lemon and fresh oregano in the sauce, they definately helped lighten it up. T: I wonder what it would have been like over rice. What do you think? A: pretty similar, only like shrimp and rice, not shrimp and grits! 😛 perhaps pasta? T: That could be good. I could see it. A: man, we’ve really been lacking veggies as a part of our diet lately! T: we had artichokes last night. is that a veggie? A: uh… well… it’s a flower, right? i don’t really know if flowers are considered veggies… Damn this veggie thing!!! why is it so damn hard to decipher if things are or are not veggies! T: yeah, i’m lost. I don’t even know what a veggie is. I’m not sure they exist. everything’s a damn fruit or a flower or a damn this or that. Where have all the veggies gone? A: long time paaaaassing, where have all the veggies gone, long time agooooo…. T: And what about the cowboys? eh? A: uh, that was just a bad song. we try to not think about those or they will get stuck in your head and drive you mad! T: right. (to self: stupid, stupid!) sorry. T: Umm… now I have the cowboys song stuck in my head. I need you to sing something else so I can free my mind from the cowboys. A: free your mind, the rest will follow. be color blind, don’t be so shallow. T: thanks, I’m good now. OMG It looks gorgeous and I bet it’s quite tasty. I dig shrimps or prawns you know! Hi Jack! we get a kick out of you commenting here (not to mention we love your site – especially being relatively new to san diego). Thanks! Why thank you Charles! who doesn’t love a nice large shrimp! (is that oxymoronic?) – and thanks for sending renny…the more the merrier! RennyBA, mmm cold white wine and boiled shrimp! I could definately go for that right now. I say the norwegians know how to do it right! Over rice, this would be an “etouffe.” Over my tongue, it would be delicious. Thanks for the link! I just came across your site today. You know what’s sad? I went to college in the South and I suppose I’m technically from the South (D.C. area) and I’ve never had shrimp and grits! Those shrimp look good (shrimp are my favorite food). I look forward to reading more on your site. Apologies for my ignorance but what are grits? I don’t think we get them over this side of the pond, at least not by that name! They look very good though and so do the shrimp! Despite being somewhat Southern, I can’t get behind grits. Something about their texture skeeves me a bit. But I sure would eat up those shrimp right quick! Hahahah yeah you bet. And hey I am adding your blog on my list. TC ! 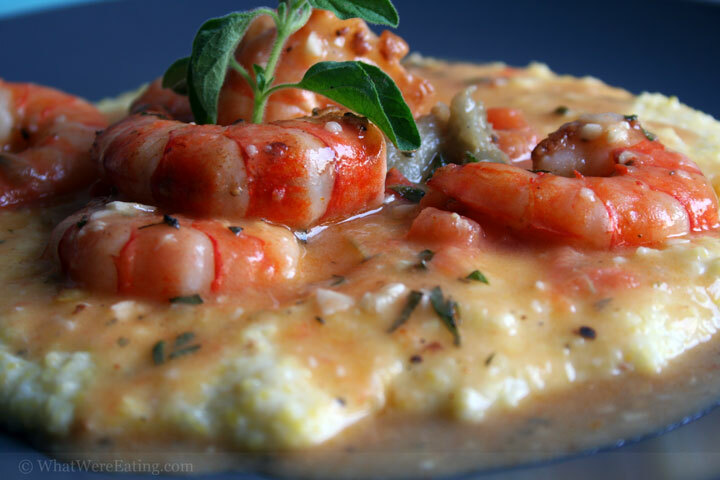 Grits and Shrimp is an awesome combo guys, I love reading your blog. Check out my site sometime I think that you’ll like it. strangely enough, i was having the same conversation with friends the other day…why aren’t shrimp and grits common in louisiana? we got shrimp, we got grits…but never combined! too bad. it’s delish. adam, over here in socal it would be banned – due to fat content and tastiness. kady, i know what you mean. neither t or i had ever eaten shrimp and grits before this meal and t’s from louisiana and i grew up in virginia! wierd! michelle, i think i was 25 before i came to like grits…and i’m only 26 now! the last restaurant job i had, we served killer grits and grillades for breakfast every saturday, that’s when i got hooked. i still can’t eat them by themselves though! thanks teo! we did check out your site, and we did love it. the layout and the graphics are great! pam, i know what you mean – i lived in baton rouge for over 7 years and tyler lived there for over 24 year and never once did either of us eat shrimp and grits there! just crazy. btw, how is new orleans doing these days? when we left (in january) it was still a ghost town. Amanda, what part of VA are you from? I’m from NOVA but went to school in Richmond. Do you miss VA? I get homesick every now and then since SD is so completely different. new orleans is not so bad right now, depending where you are. i’m sure lots would disagree with me, but where i live (algiers) and work (cbd) you can almost fool yourself into thinking life is normal.